Artist's concept of a small snake robot exploring Mars along with a rover. Mechanical "snake robots" could boost the scientific output of next-generation Mars rovers and get them out of jams from time to time, researchers say. Small, serpentine robots could help Mars rovers collect soil samples from crevices beneath rocks and other hard-to-reach places, and they could pull their wheeled siblings to safety if the bigger vehicles get bogged down in soft sand. "The connection between the robot and the rover also means that the snake robot will be able to assist the vehicle if the latter gets stuck," said Pål Liljebäck, a researcher with the Foundation for Scientific and Industrial Research in Norway, or SINTEF. 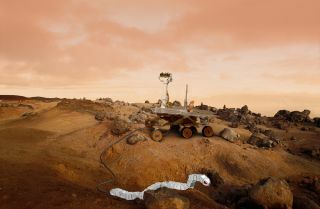 "In such a situation, the robot could lower itself to the ground and coil itself around a rock, enabling the rover to pull itself loose by means of the cable winch, which the rover would normally use to pull the snake robot towards the rover," Liljebäck said in a statement. Such a backup may have been able to save NASA's Spirit rover, which got stuck in 2009 after exploring the Red Planet for five years. Unable to point its solar panels toward the sun over the Martian winter, Spirit stopped communicating with Earth in 2010 and was declared dead a year later. SINTEF, with assistance from the Norwegian University of Science and Technology, is currently conducting a 500,000 Norwegian krone (US $84,700) feasibility study for the "snake robot" technology. SINTEF researchers envision a Mars rover carrying the snake much of the time, dropping the smaller robot at soil-collection sites or other areas of scientific interest. The rover could then analyze the snake-snagged soil or set it aside for transportation back to Earth. The snake could fit atop or underneath the rover, as long as the wheeled vehicle were outfitted with some sort of hoisting mechanism to pick it up. But there are other possibilities as well. "One option is to make the robot into one of the vehicle's arms, with the ability to disconnect and reconnect itself, so that it can be lowered to the ground, where it can crawl about independently," said Aksel Transeth, also of SINTEF. The European Space Agency expects to receive a more specific proposal in December from the researchers. There's no word yet, however, on when the snake could crawl on Mars. ESA is planning a Red Planet rover to launch in 2018 as part of the ExoMars mission.